First and foremost, I'd like to extend my thoughts and prayers to the victims of the Paris shooting. It makes me sick to my stomach that there are heartless terrorists killing innocent people. What's even scarier is that we don't know if they will ever stop and where they will strike next. Every person has their dreams, their family, and their loved ones. Every life is just as important as our own. I wish they would just stop hurting people! On a lighter note, it was very windy in San Francisco today. It was a perfect day for my J. 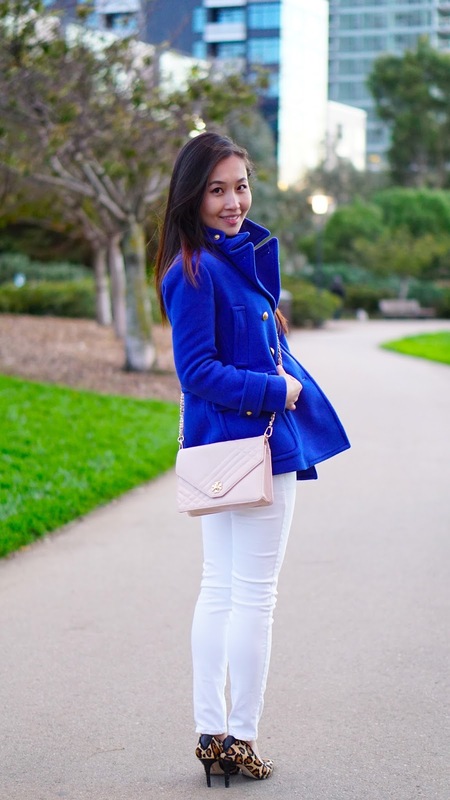 Crew royal blue majesty peacoat (here, color sold out in petite size) paired with this white ankle jeans (here) I found at Uniqlo. For most of my basics like tank tops, tee shirts and tights, Uniqlo is usually my go-to since their fit is flattering and doesn't break the bank. I say "ankle jeans", but they don't quite hit my ankles since as I have shorter legs (heh). Instead, it came out to be a perfect length jean which I didn't need to fold or have hemmed. I usually need to wear 28inch inseams or lower for jean/pants depending on the brand. I got some food and makeup on the jeans (I'm clumsy) but there was minimal shrinkage and the stains came out entirely. Overall pretty high quality jeans! Being that it was really windy today, the coat was really great at blocking the wind and once I extended the collars, it was warm enough without a scarf. This shade of blue is also very pretty! Love the outfit! The coat and the trousers look great together. I love that coat! 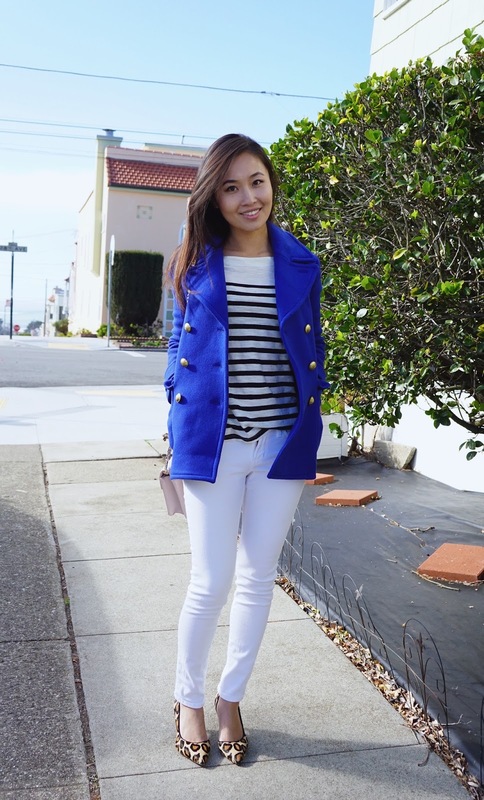 The color works so well with the rest of your outfit - black and white striped top and white bottom. What a beautiful coat! 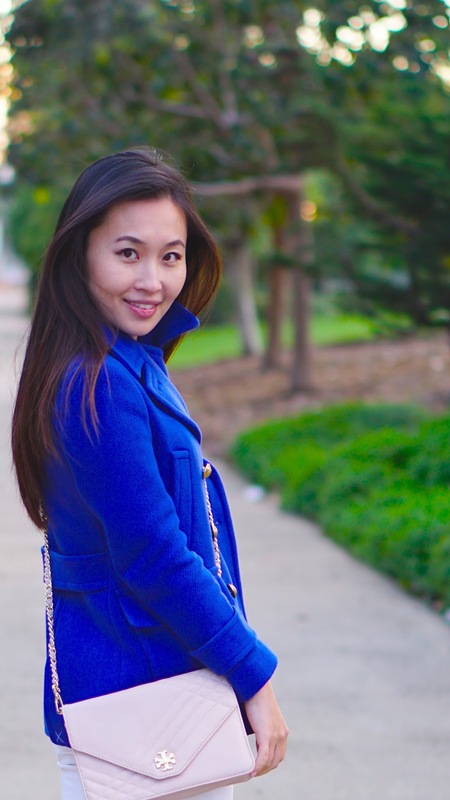 I love the royal blue color! You look gorgeous is royal blue, it's one of my favourite colours :) I love your heels so much! 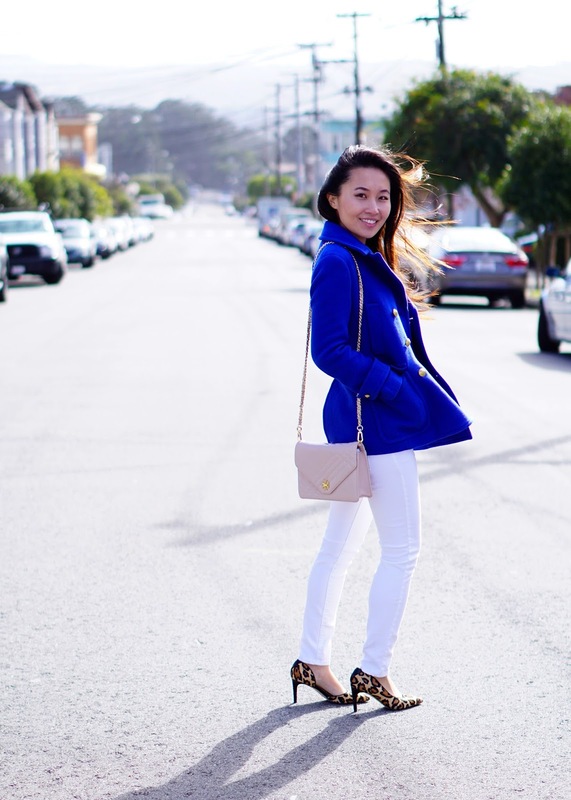 Love this outfit <3 You really made the bright royal blue coat pop by pairing it with white jeans :) And the leopard print shoes just complete the whole ensemble for a very chic look!